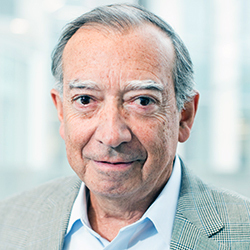 Jorge Nocedal, Walter P. Murphy Professor of Industrial Engineering and Management Sciences at Northwestern Engineering, has received the John von Neumann Theory Prize from the Institute for Operations Research and Management Sciences (INFORMS). The award is widely regarded as the most prestigious theory prize in operations research. Named after John von Neumann — a mathematician, pioneer in quantum physics, and member of the Manhattan Project — the prize is awarded annually to a scholar (or scholars) who has made fundamental, sustained contributions to theory in operations research and the management sciences. Six previous winners have gone on to win Nobel Prizes. Nocedal officially received the prize, which includes $5,000 and a medal, this week at INFORMS’s annual meeting in Houston, Texas. Nocedal’s research lies at the interface of computer science, operations research, and applied mathematics. He has made fundamental contributions to the theory of nonlinear optimization methods and created new algorithms for a variety of applications. His nonlinear optimization software, KNITRO, is used in the energy, computer, and financial industries to optimize everything from the design of computer chips to the production and delivery of electricity. A highly cited researcher, Nocedal has received several awards for his work, including the George B. Dantzig Prize from the Mathematical Optimization Society and the Society for Industrial and Applied Mathematics (SIAM). He is also a fellow of SIAM and was named Northwestern’s Bette and Neison Harris Professor of Teaching Excellence from 1998 to 2001.